The cinema is now open at this Edinburgh Retail Park. ODEON Fort Kinnaird: State-of-the-art chain cinema for blockbusters in 2-D or 3-D format, plus family and student deals. The new 7 screen cinema including a special Dolby Atmos screen. This ODEON cinema opened on 20th March. Plans for a 1200-seat multiplex at Fort Kinnaird, Edinburgh has been approved. The proposed seven-screen complex – to be run by Odeon on the site of the cinema demolished in 2008 – is forecast to attract 46,000 customers per year and draw 90 per cent of its trade from competitors across the Capital. This Edinburgh shopping centre consists of 48 retail units, 3 food outlets, 2 leisure outlets and an industrial estate with a factory and additional offices. This retail centre has 50,854 sq m of accommodation and over 2000 car parking spaces. Reid Architecture, formally Geoffrey Reid Associates, are one of the UK’s largest architectural practices. 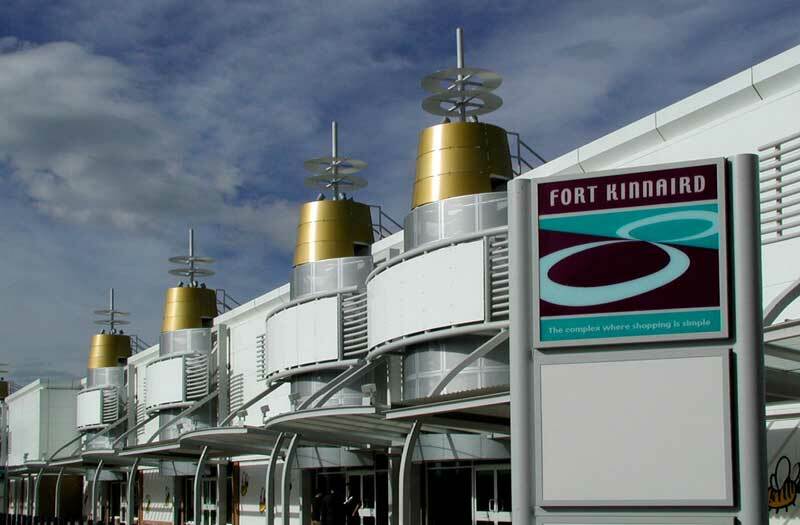 Fort Kinnaird was the first out-of-town Scottish shopping location for Officers Club, Gap, H&M, Etam, Clinton Cards, Early Learning Centre & Beaverbrooks. Fort Kinnaird in Edinburgh was the UK’s largest out of town shopping park on completion, designed by architectural practice Geoffrey Reid Associates for Pillar Property. A mixture of 12,850sq m (138,000sq ft) development and 28,100sq m (302,000sq ft) redevelopment, Fort Kinnaird offers excellent customer choice. A UCI cinema and a Megabowl are complimented by several restaurants, as well as a bank and many top high street retailers, like Gap, H & M Hennes, Beaverbrooks and Borders, which have all opened on the park. Typical Fort Kinnaird shop facade – why do planners allow identikit storefronts? Pillar acquired the two existing retail schemes, known as the Fort and Kinnaird Park, plus the brownfield site between them, and planned to redevelop the new area as one large fashion park by connecting the three sites together. The creation of a new tree-lined spine road, the integration of public transport routes and the upgrading of most of the old park frontages helped achieve this and led to the re-branding under the single banner, Fort Kinnaird Shopping Park. The architectural brief required flexibility of use and so Geoffrey Reid Associates created a simple box envelope in terraces for different predetermined unit sizes. 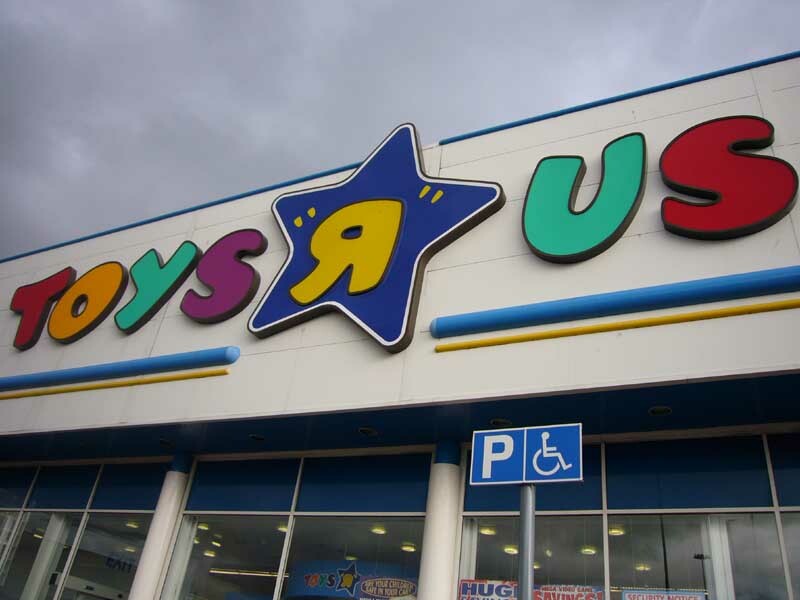 Usually entrance features are integral with the front of a building and are difficult to change during construction, however the flexible design of the shopping centre meant that they could be moved into any structural bay at any time. This important feature of the Kinnaird Park design gave us the benefit of flexibility until the very last moment, says Chris Hacking, Director at Geoffrey Reid Associates. One entrance feature was literally craned and moved into the next bay and we were even able to add extra entrance features post-completion to provide further sub-division of units to suit new tenants. The prominent sopping centre entrance features are very much the focal point of the scheme and provide a beacon to the park from the A1, he continues. And at night carefully positioned lighting shining underneath the discs emphasises them even more. Mark Stirling of Pillar Property says, The new development has been enormously successful in bringing high street retailers into an out of town shopping park for the first time. The distinctive design and flexibility to provide for different unit sizes by spanning the roofs front to rear has assisted in this process. Kinnaird Park serves the whole Edinburgh catchment. It is situated in an area where the local authority is currently promoting significant residential development. 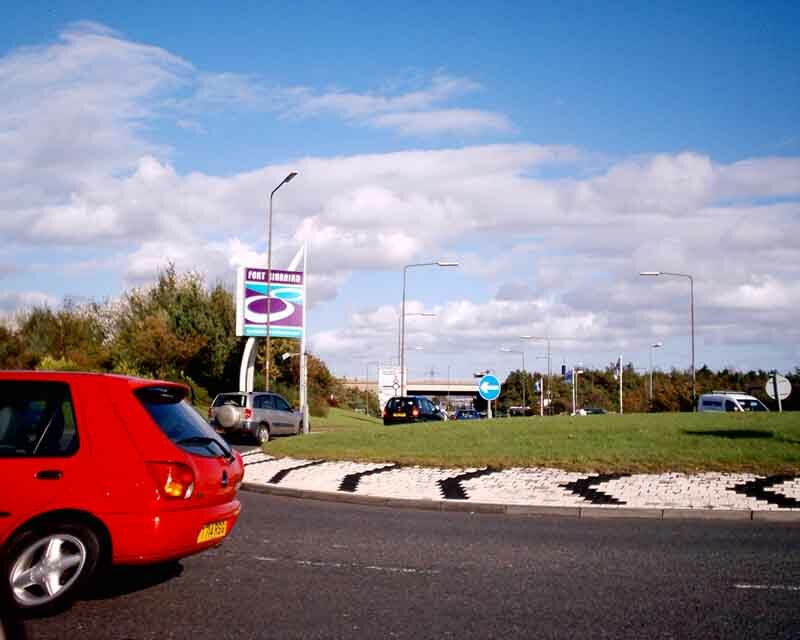 There is easy access to the shopping centre, which is adjacent to the A1. There are already bus stops on Fort Kinnaird site and proposals on the table for a bus route to run through it. In the next 12 months there should also be a local Cross Rail route station adjacent to the Fort. PC World, Pilot Clothing Limited, The Link, Beaverbrooks The Jewellers Ltd, Time Computers Limited, Etam plc, C&J Clark International, Borders (UK) Ltd, H&M Hennes Ltd, Gap (UK) Ltd, Pizza Hut (UK) Ltd (tbc), Birthdays Ltd, Logo Outlets Ltd, The Officer’s Club Ltd, J D Sports, Bank of Scotland, Claire’s Accessories UK Ltd, Phones 4 U Ltd, The Jessop Group Ltd, Halifax plc ATM pod, Lloyds TSB Bank plc ATM pod. Obviously this list will vary over time. 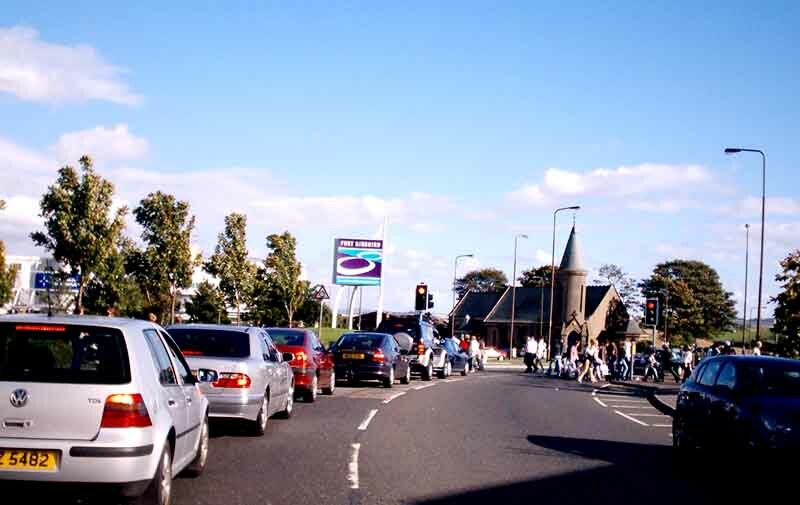 Fort Kinnaird Shopping Development PR, 11 Apr 2001, from Geoffrey Reid Associates, at top of page. This shopping centre is located at the south-east entry to Edinburgh.